Nestled on a top of the hill at an altitude of 128m above sea level enroute to Bheemili town, Thotlakonda is an idyllic destination for Buddhists who throng to this place in large number from wide and far. It was first founded by Indian navy during aerial survey in 1993. It is said that the place was in full process from 200 BC and 200 AD. Literally means "Hill with stone wells" due to its stone wells that collected water for Buddhist people. Thotlakonda complex is beautiful with magnificent structural design and meditation halls constructed to tender peace and harmony to monks. The Buddhist monks arriving from places like China, Burma and many other countries would stay at this site for months before finishing their learning. 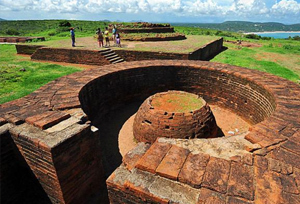 Thotlakonda Complex is a dwelling of various Stupas, Viharas and Chaityas. This wonderful and peaceful monastery positioned atop the hill gives ideal destination for worship and even exploring the sights. Discovering Thotlakonda will be an utmost experience for anybody. Moreover, one will have beautiful memoirs to take back home.